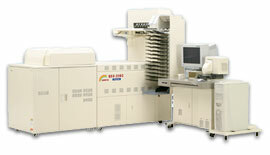 The QSS-3102 digital printer is an ideal choice for environments with demanding productivity requirements. Performance features include dual-lane output, which effectively doubles print capacity, and other speed-boosting functions like a high-speed scanner. 3.25", 3.5", 4", 4.5", 4.6", 4.7", 5", 5.1", 6", 6.5", 7", 8", 8.3", 8.5", 9.5", 10", 11", 12"